Try Continuous Ink System with your Brother MFC-3220C and make 30 times more quality prints for the same money! Pay only 0.04 USD for A-4 full color print! The Brother Inkjet printer combines all functions required for personal documents processing. It can work as a printer, fax, scanner and copier. For its operation the device uses piezoelectric inkjet technique, which helps to provide high quality color printing. Such machine model can produce up to 2 500 prints a month, which is quite enough. The device color printing resolution is 6000 x 1200 dpi. It is provided with a Wi-Fi connection, besides it has a USB 2.0 port, through which the MFD can be connected to any computer. As a rule, the device is equipped with a color fax whose memory can keep 200 pages and whose operating rate reaches 14.4 kilobit per second. Print, copy and scan color documents and photos at home by means of this compact and stylish multifunction device and ink supply system CISS for Brother MFC-3220C. The inkjet printer incorporates a wireless Wi-Fi interface and a card reader, which lets you print high quality images directly from a memory card. An inkjet printer completed with a CISS, like our CISS Brother MFC-3220C, is very easy to operate and it provides high operating rate and high quality photo printing. All these parameters make it ideal for operation at home or in a small home office. Installation of the CISS Brother MFC-3220C, as well as that of similar models CISS for Brother MFC-3420C and CISS for Brother MFC-3820CN, can not cause any changes or damages to the printer. This operation is as easy as cartridge replacement, with the only difference: you have to fix its flexible multi-channel tube to the printer case with fasteners and scotch. Besides, the system installation will make your print head service life longer. The ink tanks have convenient openings for ink refilling. By means of the multi-channel flexible tube they are interconnected with special cartridges, which replace the original ones. 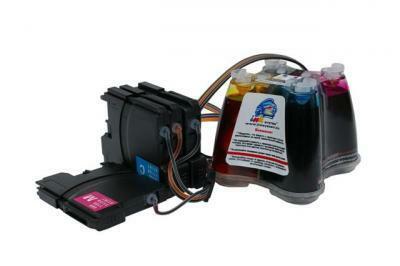 In the process of printing, the ink runs out which causes pressure decrease inside the cartridges. This makes the ink move from the external tanks via the flexible tube to refill the cartridges. This is the way the CISS MFC-3220C continuous ink supply system operates to feed the device print head with inks. The only thing you need to do sometimes is to add inks to the external ink tanks, which is possible even during printing process.